Trevenant in game: 297 Who? Important notice! 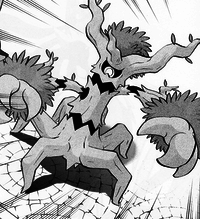 Pokemon Trevenant is a fictional character of humans. Trevenant (Japanese: ?—??? Ohrot) is a dual-type Ghost/Grass Pokémon introduced in Generation VI. Trevenant is a slender brown tree that stands on six roots bent like spider legs. Its inner body is made up of black shadow, which is mostly covered by tree bark. There are two large, crooked horn-like gnarls on either side of its head, and another smaller gnarl on its forehead, with a tuft of green leaves in the middle and a large, menacing dark-red eye below them. Its two arms are held horizontally level, thin upper arms and thick forearms, like the body, is made up of black shadow covered with tree bark. Each upper arm has a single small spike or leaf. The forearms have a small branch immediately before a large cuff of green foliage at the wrist, connected to hands with three wooden pincer spikes for fingers. Trevenant can use its roots as a nervous system, allowing it to control trees at will. It uses this ability to trap those who bring harm to the forest, so they can never leave. Despite its terrifying appearance and power, it is known to be kind toward the Pokémon that nest in its body. 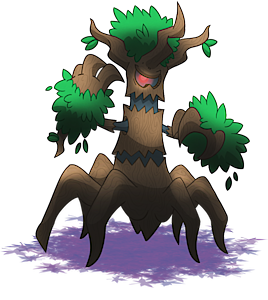 Along with its pre-evolution Phantump, Trevenant is the only known Pokémon capable of learning Forest's Curse. Trevenant debuted in Forging Forest Friendships!, where it kidnapped Ash. It wasn't malicious, though: it only wanted help rescuing its friends Bonsly and Sudowoodo, who had been trapped by Team Rocket. A Trevenant appeared in Pikachu and the Pokémon Music Squad. A Trevenant appeared in Diancie and the Cocoon of Destruction. An image of a Trevenant appeared in A Performance Pop Quiz!. XY038 Trevenant Ash's Pokédex Trevenant, the Elder Tree Pokémon. 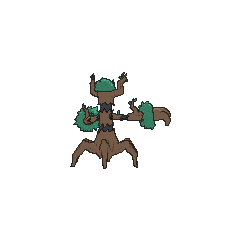 A Ghost and Grass type, Trevenant is able to control trees. It traps those who cause harm to the forest and never lets them escape. Essentia owns a Trevenant. It was first used to stop Korrina and Gurkinn from escaping the Tower of Mastery. Later it constricted X, Y, Shauna Tierno and Trevor to prevent them from opposing Team Flare's operation to move a dormant Xerneas back to their base. This Pokémon is said to devour anyone daring to ravage the forest. To the creatures dwelling in the forest, it offers great kindness. Moves marked with a superscript game abbreviation can only be bred onto Trevenant in that game. For other sprites and images, please see Trevenant images on the Bulbagarden Archives. No other Pokémon have the same Egg Group combination as Trevenant and its pre-evolution. Trevenant and its pre-evolution were designed by James Turner. Trevenant is probably based on a kodama, the spirits of trees that sometimes inhabit old aged trees. Its stripe-like indentation on its body is very similar to shimenawa, used to mark spiritual habitation, who are often seen tied around kodama. It is also similar to other types of tree and nature spirits, such as dryads. 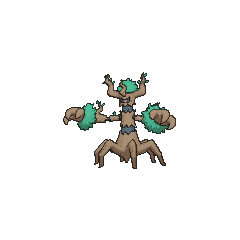 Trevenant's fierce protection of forests may be a reference to hamadryad, or could perhaps be a nod to the concept of protected sacred groves. Its single eye may possibly be a reference to cyclopes or the mountain dwelling yamawarawa. Its general body shape may have been based on the shape of the kanji ?, meaning wood or tree. Its Shiny coloration is based on the birch tree, known for its gray-and-white bark, with its leaves representing a tree in the autumn. Trevenant is a combination of tree (or possibly treant) and revenant. Ohrot may be a combination of ? o (big) and ??? rot (as in a root rot).